We've had a professional designer re-build the frontpage to be more corporate, clean, and stand out more. The front page is a lot less cluttered, and will attract a lot more users than the old basic bootstrap design. 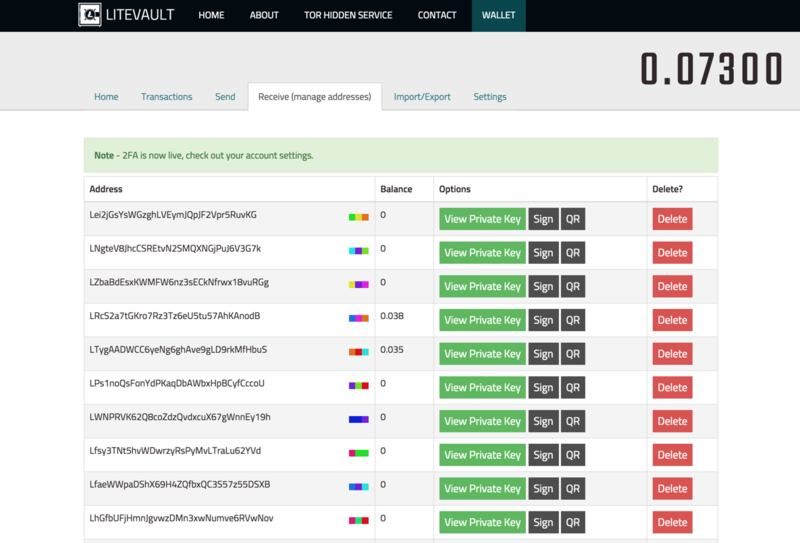 The actual wallet page has been re-designed to be more clean and usable, and matches well with our new design. We've added a new unique feature, color tags, which are a set of 3 colours generated from your address that will always stay the same, these tags allow you to visually identify an address quickly, without having to look at the balance or compare the first few characters of the address. QR Codes have been requested for a while. Clicking the "QR" button in the options column will bring up a screen similar to above, this lets you scan the QR code on a Litecoin mobile wallet app, so that you don't need to enter the address by hand and risk typos. Another much needed change is that the private keys are now hidden behind a "view private key" button. On top of this, per-address balance is now visible on the Receive page, instead of only on the Send page. Because of the large user interface overhaul, these small changes have been backlogged until now. 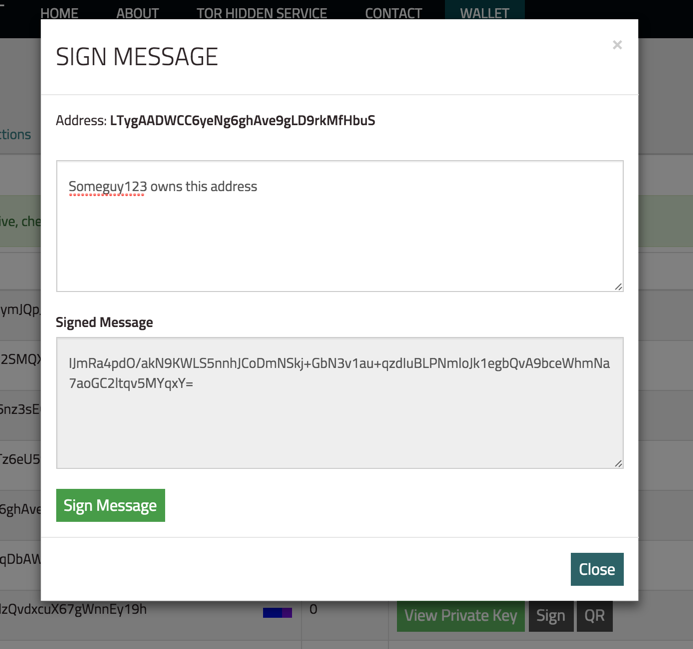 Message Signing is another important feature we've added. This allows you to sign a message using your address to prove ownership. This feature is required for various Litecoin services, such as pools, to prove you own your withdrawal address when you want to change it. The list of transactions will now automatically update every set number of seconds, previously this was a static list that only updated after you logged in. A small bug was fixed where the address list on the Send tab would reset to the first address every 20 seconds, removing your selection. While not visible to a lot of users, there have been a lot of backend tweaks and fixes to allow LiteVault to work better in non-webkit browsers such as FireFox and Internet Explorer. Overall we've added a lot of much needed features, and fixed numerous bugs affecting daily usage of LiteVault. The new design brings LiteVault to a stable state, with enough features for daily usage. 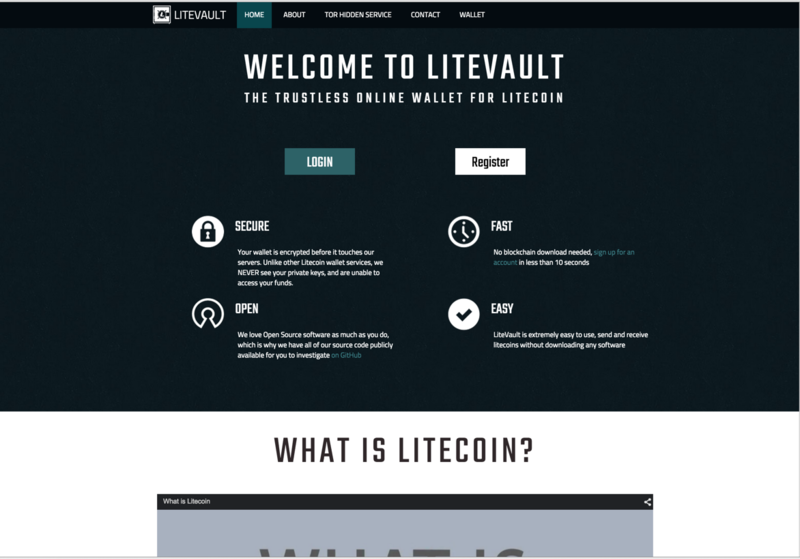 We hope that you enjoy using LiteVault and have a great experience. If you like LiteVault, please remember to donate. We don't run ads or have any method of monetary gain apart from donations. Without your help, LiteVault cannot continue to run, servers are expensive, and development time is based on how many people donate (more donations means a more stable, featureful, secure, and faster LiteVault).